I've been in Phuket since last Thursday, once again training at Phuket Top Team. Since the last time I was here, they have even further improved the training schedule. This is what Monday and Tuesday look like; every other day except Sunday (when they close) looks pretty much the same. I really like that I can get up at dawn (6:30am here), go train Muay Thai, be done by 9, get breakfast and nap, get some sun by the pool, then do another afternoon session. The best part is the flexibility; if I feel like doing Muay Thai in the evening I can do that, or I can do MMA, or wrestling, or no-gi grappling. 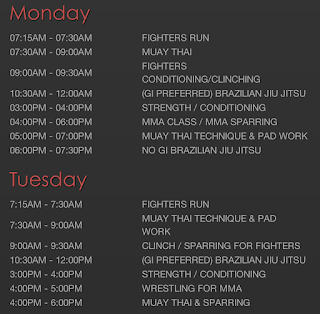 As you can see, the day finishes very early (one of the unfortunate things about MMA gyms in most big cities is that the classes go very late because people come in after work). When I was training for my fight in Vancouver, I often didn't get out of the gym until almost 11pm, which really messed with my sleep. PTT has grown since I was last here 11 months ago. The instructor-to-student ratio is still pretty good so I still get a decent amount of personal attention, and now there are more sparring partners as well. So the growth has actually been a good thing. They have also added MMA wrestling which is great, because my wrestling is still fairly terrible. The wrestling is headed by Andrew Leone who was a decorated collegiate wrestler and also a 125-pounder! Before I came, I was excited to train with a guy who is at the elite status of my weight class (he holds an MMA win over a guy who is now in the UFC). I haven't gotten the chance to actually roll or spar with Andrew yet but I've enjoyed taking his wrestling class. It really is fighter paradise here. I feel like this is possibly the place where I would really be able to optimize everything and fulfill my potential as a fighter. If I had absolutely nothing else on the go, I might consider being here very long term (like 3-6 months or even more), but alas I'm only here until Thursday. The only thing that would get to me about staying here would be not having any of my friends around. The fellow fight tourists seem cool and all, but the friendships you build are necessarily ephemeral. And it's fairly unlikely I would ever have a girlfriend here - most of the foreign girls don't stay very long, and while Thai girls are attractive and nice, I think there's far too much of a cultural barrier to find an ideal companion for me here. But in terms of being able to optimize and tailor my own training with no real limitations, and stay healthy, this would be a great spot. And while I have some projects planned back on the other side of the Pacific, you shouldn't be terribly shocked if you end up reading about some sort of semi-long-term relocation to Phuket. Can't right now! But will probably do so soon.